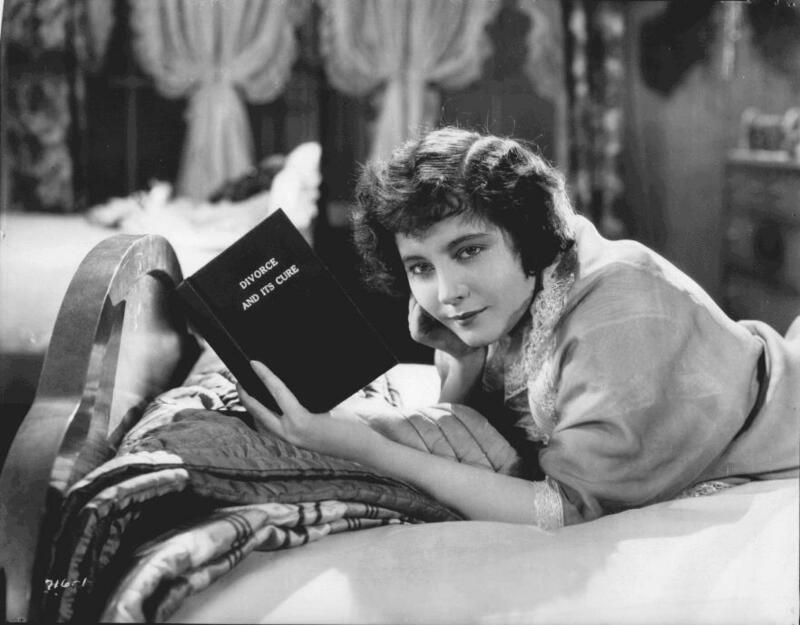 I’ve seen many strained marriages portrayed in silent film, but not once—ever—did any of them end in divorce. Except in this movie. 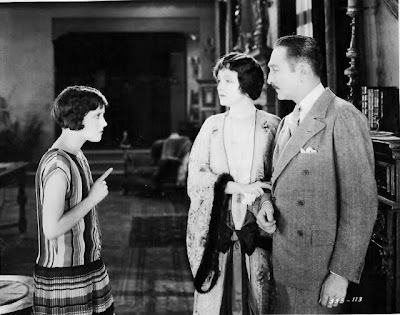 The wealthy, bickering Hazlitts (played by Adolphe Menjou and Florence Vidor) are separating when the picture starts; when they suddenly make things final, we’re told in passing! ‘Following their divorce...” or something like that, then on to the matters at-hand. To treat this subject in so blasé a fashion, even in the middle of the Jazz Age, was a big deal. See, divorce cropped up all the time in silent films, because marital discord, and the means to overcome it, were such popular themes. But divorce didn’t happen. Divorce was what would happen if one or both parties (usually the husband) didn’t shape up. Divorce was the catastrophic end result for a bad spouse—just as poverty was for the profligate man, and death, for the drunk. The story, then, was how a man and wife avoided divorce, not how they dealt with it once it happened. The Hazlitts, however, are just likeable people who can’t get along, and have the maturity to realize it. They fight, sometimes bitterly, but they aren’t cruel to one another, and would no doubt go their separate ways quite easily if not for the fact they both love their teenaged daughter, Lita, fully and equally, and each wishes to have the lion’s share of custody. Lita (Betty Bronson) is understandably distraught by this, but soon adapts. We see her return to boarding school following the news, and no one stigmatizes her for her family’s breakdown. It’s all very 21st century. Well, not entirely. In a cinematic period when marriages survived infidelity, destitution, and even domestic violence, the Hazlitt’s fickle story seems to beg for a happy ending, and I never believed it would fail to provide one. You can’t have it both ways, yet this movie tries: first portraying a healthy divorce between decent people, then refusing to accept divorce as a solution to a bad marriage. Are Parents People? treats the divorce itself as the problem to be solved, and that doesn’t work. Ironically, the actors make things worse by being so good. Menjou and Vidor deliver understated performances that temper the comedy with healthy doses of awkwardness and pain. And Bronson plays Lita as smart and grounded—exactly the sort of kid you’d expect the Hazlitts to raise. The movie, then, must undo the results of three mature people acting in sensible fashion. Why would you want to do that? It was fixable. If your film is a foregone conclusion, like this one surely is, then swing for the fences. Go for farce. But director Mal St. Clair fails to do that with the characters who matter most (the three leads), and instead restricts the comedy to an elaborate sub-plot, involving a movie star with whom Lita is accused of being in love. The star, through elaborate means, ends up visiting Mrs. Hazlitt and his recount of his greatest roles is a fine piece of goofball hammery. Lita’s real would-be lover is the dashing Dr. Macer (Lawrence Gray), and there’s a few choice misunderstandings there, too. But the Hazlitts themselves live in the real world. And Lita’s on-again, off-again wackiness belies the scientific approach she takes to their reconciliation. She turns to a self-help book for strategies: a scene which squeezed chuckles out of us audience members at first, but less so once we read a passage from the book, explaining that feuding parents can reunite through common anxiety over a child in peril. What terrible advice. In fairness, I can relate to Lita. Though my parents have a healthy marriage, I too am an only-child. Only-children have all the benefits of their parents’ undivided attention; however, if their parents are on the same page (that is, if the parenting is effective), the only-child faces two-on-one odds. This colours your perspective. Were my parents divorced, I too might have taken the approach that Lita does. After all, I was used to being the sole focus of their concerns, and even if they were united against me, that would prove, above all else, that they were united. On the other hand, I’ve also been divorced. And I know that staying together for a common cause, whether it be a child, money, a job or a home, is hopeless. Lita’s unaware of the fact that people can love the same thing while remaining incompatible with one another. But she’s still a kid, and that’s her excuse. The film simply ignores it, and wilfully so—keeping its sights set on a happy ending which grows phonier and phonier as we approach. Maybe you’d see things differently, but for me, this conclusion is just another bad beginning. I saw Are Parents People? live at Cinefest, in Syracuse, NY. Piano accompaniment was provided by Dr. Philip Carli. Dropped an email to your admin address. That's the best way to get ahold of me.